Compression moulding is ideal for larger items, in particular where fabric inserts and reinforcements are required. The tooling consists of a cavity mould in which the thermosetting rubber is placed and heated up, after which the tool top is forced into the cavity displacing the material to fill the mould. The mould is then allowed to cool before removal. 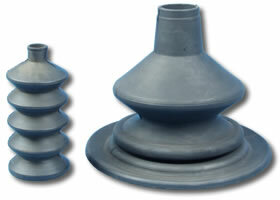 Examples of transfer moulding include our circular bobbin mounts and ring buffers.